At Walt Disney World, there is a fleet of buses that are there to serve guests and cast members in getting to their desired locations around the property. 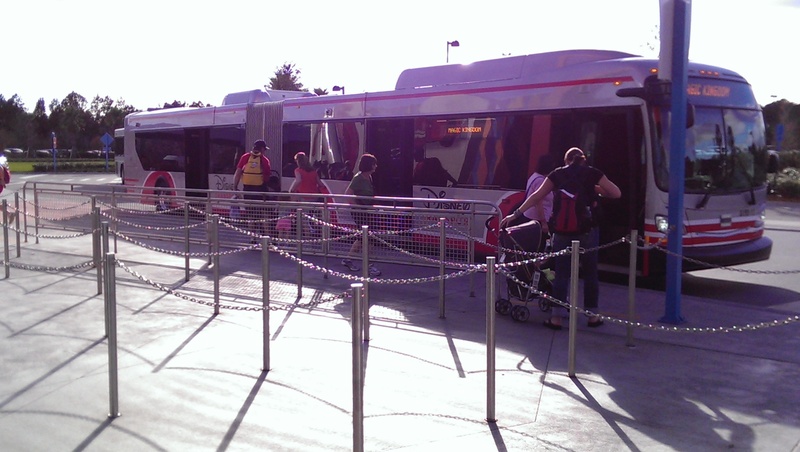 Most of the fleet are serving the resorts taking guests to one of the parks, water parks, or Downtown Disney. And, while using the bus can be a little bit time consuming, it is incredibly reliable in the experience I have had with them. In general, buses will depart from your resort about every 20 minutes. However, first thing in the morning from the resort does seem to be a little closer together. And, the same is true for the later returns from the parks. Recently, new Articulated Buses were added to the fleet to move more guests from some of the larger resorts. Art of Animation and Pop Century are just two that I know of at this time. I believe that Port Orleans – Riverside may also be making use of these newer buses. They are very sharp looking and can carry about two and a half times more passengers. This should cut down the amount of time waiting in a queue to board. A few reminders: Please be courteous to other passengers. If an elderly person, or a lady with a baby board offer them a seat! Most rides are 10 to 15 minutes in length, and I know you may be tired from a full day, but so are they! Also, treat the drivers well as that isn’t as easy of a job as you may think. And, they are a fabulous source of information and assistance! If you want to check on bus routes and time of travel, check out the Transportation Wizard at http://www.ourlaughingplace.com/aspx/twiz.aspx#.UtwtWBAo7IU.